The HEARing CRC is undertaking a program of research that addresses the twin challenges of maximising lifetime hearing retention, and reducing productivity losses from hearing loss, through improved remediation and better take-up of technology. To address these challenges, the HEARing CRC is conducting a coordinated program of research and innovation under four Themes – shown in the research wheel below. Click on the research wheel below to find out more about our research activities. Our research programs are focused on innovative research and development across the hearing healthcare spectrum and benefit from the capabilities and infrastructure provided by HEARing CRC Members. 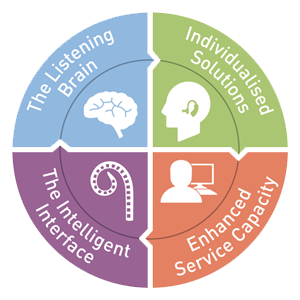 self-fitting and web-based hearing healthcare delivery models that enable improved access for regional and remote communities and foster risk-reducing behaviours to prevent acquired hearing loss. Our research contributes directly to the Australian Government’s National Research Priorities of promoting and maintaining good health, principally to the objective of aging well and aging productively. A primary focus of The HEARing CRC is ensuring the translation of research into clinical application. To achieve this, we have recruited Members who together provide a significant subject pool for evidence-based clinical trials. This enables us to undertake studies evaluating a range of research and technology at the earliest stage; it also involves potential end-users in our activities. The overall research project portfolio for each year of activities is reviewed annually by the Board, and any changes are made based on advice or recommendations from management and the Science Advisory Group. The Board also considers any new information from Members and/or changes in the field, commercial or clinical environment that indicate either improved or decreased potential for the projects’ application. This approach ensures that resources remain focused on projects with the most significant commercial potential and greatest overall end-user impact. The four research program areas are supported by a fifth Commercialisation Program that includes clinical trials and research development. Additionally, our HEARnet Learning professional education platform enables us to communicate findings with hearing healthcare professionals, increasing take-up of new approaches, technologies and services. The HEARing CRC through its Members are also involved in other collaborations and initiatives that are also enhancing the capacity in hearing healthcare research and the delivery of clinical services for people with hearing loss in Australia. The First Voice Alliance is an affiliation of the HEARing CRC Members – Hear and Say, The Shepherd Centre and Taralye along with the Cora Barclay Centre and the Telethon Speech and Hearing Centre. Together with their New Zealand affiliated organisation, First Voice provides early intervention services to more than 1,000 hearing impaired children. 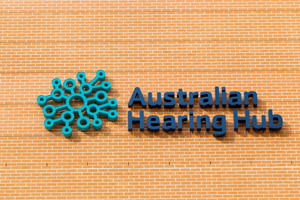 The Australian Hearing Hub (AHH) is a state-of-the art facility at Macquarie University that brings together researchers and professionals from disciplines including nano-fabrication, language and cognitive sciences, audiology, speech pathology and psychology. Opened on April 2013, the AHH builds upon the long-term collaborations established by the HEARing CRC and is a focus for partnerships amongst Australia’s research, education and clinical health services.